Nick Vagnoni was born and raised in Key West, Florida, and currently teaches writing at Florida International University in Miami. His work has appeared or is forthcoming in Mid-American Review, Alimentum, Saw Palm, New CollAge, La Fovea, Florida Book Review, and others. 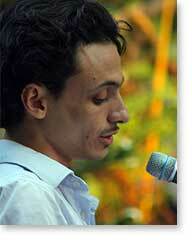 He is also a founding member of The Miami Poetry Collective.